We love houseplants! A few well-placed houseplants will brighten your space, improve air quality, reduce stress and create a wonderful, tranquil energy in your home. There are many interior plants to choose from, so finding the perfect one that complements your home’s style is easy. Where should you start? 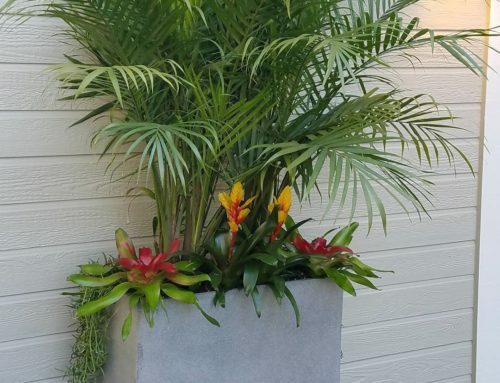 It’s important to consider factors like what color scheme you’re looking for and whether or not you have enough space for a large Kentia palm in a bold, terracotta planter? The good news is that there’s really no wrong choice when choosing the perfect houseplant, but it helps to have some suggestions! Before you consider adding a little greenery to your home, let’s take a look at some of the most popular houseplants in interiorscapes right now. Thick, green, strap-like leaves make this drought-tolerant plant standout. Snake plant or Sansevieria, is native to the tropical regions of Africa. 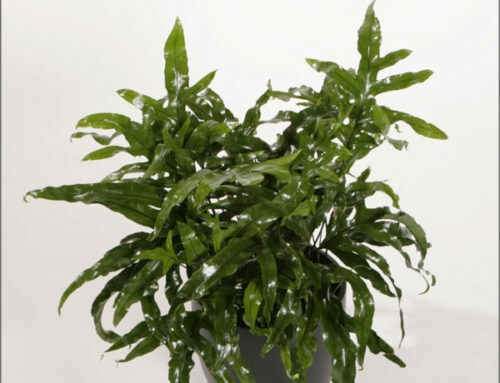 This plant is evergreen and will adapt well to many interior conditions, making it an excellent houseplant. 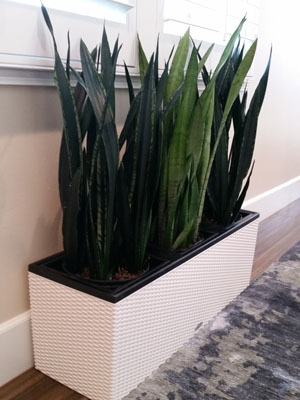 Snake plants do a great job of reducing airborne VOCs. The broad, sword-like leaves tolerate direct sunlight very well and range in size from 8-inches to 3-feet-tall. These plants is that the leaves hold a high water content, which they then release in the atmosphere through transpiration, creating a cooling effect in your space. Therefore, a few snakes plants positioned near a bright window will keep your house a little bit cooler. The most popular snake plant varieties are dark green, with white or yellow striations marbled through the leaves. Some varieties have paler green to yellow leaves throughout. 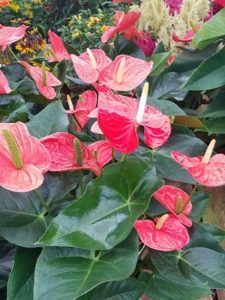 Known as the ‘flamingo flower’ with a waxy, heart-shaped spathe, this plant is experiencing a revival in the interiorscape world. The sculptural plant is an elegant addition to any decor. Most species are red, but white, pink and even green Anthuriums are found readily. It’s lovely and unexpected to enter a room and see fuchsia and pale pink-colored Anthuriums placed throughout. They are wonderful additions to entryways, living rooms and dining areas. 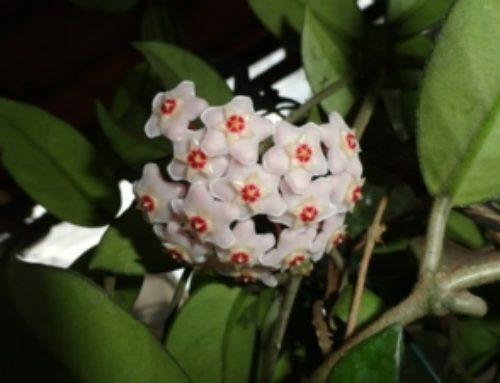 This cheerful plant is found in South America and does best in a sunny spot, without too much direct sunlight. The deep green foliage contrasted with the bright spathe makes for a bold and fresh look in your home. 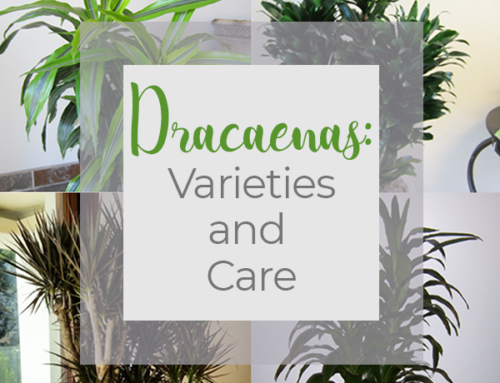 Currently, 40 species of Dracaenas are captivating plant-enthusiasts. Small, cane-like plants and larger trees can be placed on tabletops or floor spaces in decorative planters. The leathery leaves appear small and spear-like or more broad in size. One unexpected factor about these plants is their wonderful color variation! Dark green leaves are the norm, but some varieties are found in paler shades of green, with white or yellow accents, and even in burnished colors. 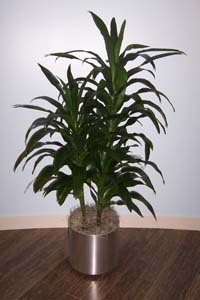 This plant is a standard in the interiorscape because it’s so well-adapted to indoor conditions. It’s rare to not spot a Dracaena in most interior spaces! When decorating with lovely Dracaenas, have some fun with it! Mix Dracaenas of different heights, leaf shapes and colors for a bold look and a rich tapestry of color. With filtered light, you will find that this is one of the easiest to care for houseplant! If you have not spotted a Ficus Lyrata by now, you’re probably not paying attention. 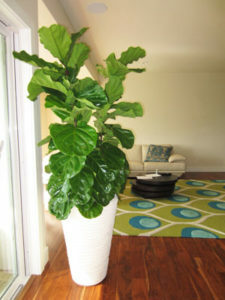 You may also know this plant by its popular name, the Fiddle Leaf Fig. It’s difficult to imagine any home without this lovely plant! Carrying a musical name because of its violin-shaped leaves, this plant will grow to about six-feet-tall in interior spaces, but has the potential to reach 40-feet-tall outdoors. The wide, dark green leaves are tropical in appearance and remind us of a gorgeous green canopy. Since this plant is so large in size, it’s best to keep them pot-bound and on the floor. Ficus Lyrata requires a little extra care as their broad leaves can collect dust quickly. They should be wiped with a dry cloth from time to time. Houseplants allow us to enjoy nature in the sanctuary of our home. A seasoned Interior Plant Technician can help you choose the perfect houseplant for you and make sure you have a green space to enjoy for many years!